University of the Free State in Bloemfontein’s segregation: How the legacy of racism lingers in post-apartheid South Africa. Why the students at one prominent South African university, once a model of racial harmony, chose to resegregate. Ramahlele got up and poked his head out the door. There he saw the students of the dorm he managed, which housed about 100 black males, some of the first blacks to attend the historically white university since it had integrated four years earlier. And he immediately saw the source of the noise: His boys were stampeding out of the dorm entryway and running toward central campus. Some of them were singing militant songs from an earlier era, when blacks fought against apartheid rule, including one that went Kill the Boer, a nickname for white Afrikaners. Many were holding sticks or cricket bats. They said they wanted to confront the white boys on campus. The whites, they claimed, refused to treat them as they should be treated in South Africa’s new democracy, and they wanted to put an end to their insolence once and for all. More than one boy opened up his jacket to show Ramahlele a gun tucked inside. Racing alongside the group, Ramahlele wasn’t truly worried until he rounded the corner and saw, under the starlight, a line of white boys at least as long as his line of black students, standing shoulder-to-shoulder. “It looked like an army flank,” he remembered. The whites were also holding cricket bats, cocked on their shoulders like rifles. Unlike his students, they were eerily silent—until, all as one, they opened their mouths and began to sing. The song was Die Stem, the old apartheid-era national anthem. I first set foot on the University of the Free State (UFS) campus in February of 2010 to study Afrikaans. On paper, the school was integrated: 70 percent of the student body was black. But 15 years after the end of apartheid—the infamous system of racial separation and black oppression that lasted from 1948 until the coming of democracy in 1994—it felt as though apartheid had never ended. The white and black students still seemed to operate in totally different worlds. There were classes in Afrikaans for the whites and classes in English for the blacks, and separate choirs and church services for both. I almost never saw a mixed-race group of students. And they didn’t live together—there were all-white dorms and all-black dorms. UFS is in the heart of the Free State, the traditional center of Afrikaner power, settled in the mid-19th century by Dutch settlers who trekked inland in covered wagons from the Dutch East India Company’s colony at the Cape of Good Hope 600 miles southwest. They believed they had been sent to Africa by God to become a new people, the Afrikaners (“Africans” in Dutch), to tame the desert—like the Israelites in Canaan—and turn it into a garden. They plowed the region into a fertile grain belt, setting up a republic and naming a capital, pronounced “BLOOM-fun-tayn,” meaning “fountain of blossoms.” The city became a laboratory for the formation of Afrikaner identity. The Afrikaner National Party, the political party that designed apartheid, was established there in 1912. UFS, founded at the same time, was the first South African university to conduct classes in Afrikaans, the Dutch dialect the Afrikaners proudly formalized as part of their new Africa-based ethnicity. I went. Karee—named for a drought-resistant tree found in the South African desert—had been built in 1978, as apartheid rule was consolidating and Afrikaans-language universities were expanding. The photos my teacher had mentioned were class photographs. The first dozen or so showed only white boys arranged on the dorm stoop, mugging for the camera. Then, in 1992, a few blacks appeared. There was one looking proud in a mauve suit, and another in a yellow shirt, his hip popped out in a jaunty contrapposto, his lips stretched wide in an enigmatic smile. 1993, 1994, 1995: Every year there were more black students, intermingled with the whites. And then, in 1997, one year after the riot Billyboy Ramahlele witnessed, something new appeared in the photo: two flags from the age of white supremacy in South Africa—one from the old Afrikaner republic and one from the apartheid state that followed it. They were jarring to see, held high by two white boys in the last row right over the head of a black boy in a wide-brimmed hat. Over the following years, the flags remained, but the black students in the photos disappeared. By 1999, the class photo was all white again, and it stayed that way until 2008, the last year for which there was a picture. Those images became a consuming mystery for me. UFS hadn’t remained segregated after apartheid’s end—it had integrated and then resegregated later. I wanted to know why the white students raised those ancient flags, and why the black students had left Karee. I uncovered a tale of mutual exhilaration at racial integration giving way to suspicion, anger and even physical violence. It seemed to hold powerful implications well beyond South Africa, about the very nature of social change itself. In our post–civil rights struggle era, we tend to assume progress toward less prejudice and more social tolerance is inevitable—the only variable is speed. But in Bloemfontein, social progress surged forward. Then it turned back. Karee is one of about 20 dorms at UFS that house a few hundred students each. The large brick buildings are situated around the edges of the stately, tree-lined campus, like guardians of tradition, which is what they once were. They had legacy admission. If your mother or father had been in a certain dorm, you’d be in that one, too. In one dorm, freshmen wore striped coats. In another, everybody but the seniors walked in through the back door. Lebohang Mathibela was the boy in the mauve suit in the 1992 class photo on the wall in Karee and one of the first eight black students to live in a UFS dorm. Integration “was beautiful,” he raved when we met at the main campus café. Dressed in a cheerful red T-shirt, Mathibela, now 42, hardly looked older than the 21-year-old in the photo, with cheeks as round as a cherub’s and a pealing laugh. 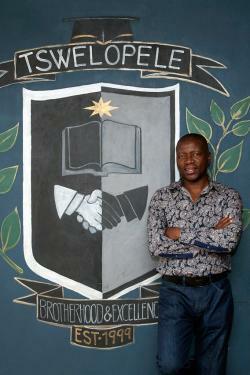 Mathibela has had an accomplished career as a linguist, speaking all 11 official South African languages. UFS wasn’t a natural choice for a black boy from Johannesburg, his hometown. There were two kinds of historically white colleges in South Africa: those that taught in English and those that taught in Afrikaans. (There were also historically black colleges, but they have generally been of lower academic quality.) The English universities cultivated a liberal, multicultural, anti-apartheid identity; they started admitting black students in the 1980s, when it was still technically illegal to do so. The Afrikaans colleges were reputed to be everything the “English” ones weren’t: conservative, mono-cultural, isolationist. UFS was the most daunting because it was marooned in the grain belt. For most aspirational black college applicants in the 1990s, venturing to UFS would be like choosing Mordor to study. “I felt proud,” he remembered. Their enthusiasm made the white students feel as if they had something worth sharing, bolstering their sense of pride. Mathibela recalls that a white student named Coenraad Jonker pulled him aside. “Where did you learn to speak such beautiful Afrikaans?” he marveled. “You are definitely going to make it here.” White students even bent some of the dorm rules to make it easier on the black students. And yet, said Mathibela, “I knew it could not last.” As his second and third year ticked by, he was still enjoying himself. But others were starting to grumble. “There were talks that there was going to be a huge change,” he said. One night, the black students in his dorm gathered in his room. They had been drinking a little, and tongues were loosened. A boy named Shadrack Modise—the boy in yellow in the first integrated 1992 dorm photo, the one with the ironic, perhaps even mocking smile—declared he was having doubts about the dorm’s traditions. Blacks had their own traditions, he pointed out. Most of South Africa’s black tribes have months-long initiation rites administered when a boy is around 16. Blacks are already men by the time they go to university. At the same time, the university reached out to bring in more black students in recognition that the Free State was about 85 percent black. Ramahlele helped lead a radio campaign to recruit black students aggressively. “Every year it [the black cohort at UFS] doubled, doubled, doubled,” he said. Everybody I talked to connected with UFS’s history mentioned the number 30 percent. It was a demographic hot line—when the feelings of a few dissidents like Shadrack Modise became the feelings of the whole cohort and black students stopped wanting to go along with the white students’ traditions. They wanted dorm culture to reflect their culture—black culture. They wanted soccer, the black sport, on the common room TV, not rugby. Verschoor, whose rumpled approachability made him a natural confidante to white and black students, remembered the complaints: “A lot of black students started asking me questions,” he said. “‘Why do we have to do this tradition or that tradition?’” He held meetings in the dorms to discuss tweaking the practices that were bothering the black students. But as soon as the black students started objecting to the traditions, the white students seemed to close ranks. “Even the white students who actually didn’t like running around naked—it became important to them,” explained Makhetha. Arnold Bender, a self-described fun-lover, was one of the white students holding up the old South African flag in the 1997 Karee dorm photo with cheeky pride. He recalled that conflict arose over “telephone service,” a tradition wherein freshmen had to man a telephone in the lobby in shifts. As a freshman in 1993, he hadn’t especially enjoyed the duty. But he experienced the black critique of telephone service as an assault on his dignity. “Why should a white freshman do an extra hour of telephone service just because somebody else thinks it’s below him?” he asked me. In many ways, the students at UFS were acting out a greater national drama. When South Africa transitioned to democracy in 1994, the first priority was emotional reconciliation. Over time, though, the theme switched to economic and social transformation. The freed black majority wanted to see material evidence of their bettered status. And yet South Africa’s institutions—business, agriculture and the arts—remained disproportionately white-designed and white-dominated. Thus, in the second half of the 1990s, the races that had initially come together in South Africa with astonishing joy began to regard each other more warily. Thabo Mbeki, South Africa’s second democratically elected president, proposed a sweeping affirmative action plan and resentfully spoke of “two South Africas,” implying the whites had refused to give up anything of value. Afrikaans town names were changed to blacker ones, and Afrikaans-language schools were shifted to English. The Afrikaners, for their part, were shocked to learn that the new democracy would result in a seizure of physical and psychological ground. In 1995, F.W. de Klerk, the last apartheid-era president, resigned from the government of unity he’d created with Mandela, alleging the new black leadership refused to treat Afrikaners respectfully. By 1998, a poll showed half of Afrikaners agreed with the statement “South Africa today is a land for blacks; whites will have to accept that they will take second place.” That figure is no surprise—blacks comprise an 85 percent majority of the South African population nationwide, reflecting the demographics of the Free State. The surprise is that when the same poll was done six years earlier, in 1992, a mere 4 percent of Afrikaners had imagined that whites would have to substantively make way after democracy came. The episode reminded him eerily of the apartheid-era conflict of his youth. Ramahlele grew up in a squalid blacks-only township 35 miles east of Bloemfontein, and multiple times, he had seen gun-swinging white policemen burst into the corrugated-aluminum shack of his mother or his aunts, often while humming snippets of Die Stem. As he saw it, here on the UFS campus, the white boys seemed to be acting out the military parts their fathers had played in the 1980s, when there was a draft for white men and flanks of white soldiers patrolled the restive black slums putting down protests. The black boys were acting out the roles of the opposition guerilla fighters. The morning after the battle, maids found a stash of Molotov cocktails hidden in the basement of Ramahlele’s dorm—the same kind of bombs Ramahlele used to fashion during his days as an anti-apartheid protester. So the administrators did. Although segregated dorms never became an official policy, informally the school let students separate. In Karee, the school even let the students put up plywood separating the black and white corridors. The east side of the building became the white side; the west, black. Verschoor remembers the banal phrase that popped into his head as he watched the plywood go up: “It’s a pity.” But it was also a huge relief. “Suddenly, there was no battle between black and white. And we thought, well, maybe this is the recipe for now.” Like other administrators, he hoped the resegregation would be temporary. The fraught race relations at UFS remained a Bloemfontein secret until 2008, when four white boys filmed themselves mock-hazing their black dormitory staff, three cleaning ladies and a male gardener. In the 10-minute clip, they subjected these black elders to a beer-drinking contest, a footrace, and a rugby match. The video culminated with a ritual in which the janitors were made to kneel at the boys’ feet and slurp a muddy-looking concoction out of dog bowls. Just before they drank, the reel cut to one of the white boys pretending to pee into the bowls. After the video was posted on YouTube by one boy’s spurned girlfriend, angry protests broke out on campus, classes were canceled, and the international news media descended on the university. Foreign reporters took the video to reveal that whites had never accepted blacks outside of South Africa’s cosmopolitan cities of Johannesburg, Cape Town, and Durban. “Racial apartheid lives on in South Africa’s rural provinces, its small city campuses (like the University of the Free State) and schools, as well as its small towns and farming districts where things have not changed much,” concluded the South African–born, America-based commentator Sean Jacobs in the Guardian. By this time Billyboy Ramahlele had given up. He could never accept the segregated dorms, and once, sitting in an administration meeting about them, he had a vivid fantasy of the entire campus on fire. “I thought, ‘Let this university go to rubbish! Let it burn!’ And I felt this headache in the back of my head. It wouldn’t go away for a week.” He was diagnosed with hypertension and post-traumatic stress. When I described the integration and resegregation at UFS to Edwin Smith, a leading black education theorist and administrator at the University of Pretoria, the main university in South Africa’s capital, he wasn’t surprised. All South African universities, he said, have struggled with race relations in their dorms, even the English ones with a liberal reputation. I asked him which of South Africa’s 15-odd major universities were thoroughly integrated nearly 20 years after apartheid’s end. “There aren’t any!” he answered, chuckling with resignation. The phenomenon is not unique to South Africa, either. In certain ways, it mirrors dynamics that occurred on American campuses as they began to integrate during the 1960s and 1970s. john a. powell, a nationally renowned civil rights lawyer and education expert who prefers to present his name in the lower case, recalled entering Stanford in 1965 as one of 28 black students in a thousand-strong freshman class. Like the white students who welcomed Lebohang Mathibela in their dormitory, most of the whites at Stanford were “friendly,” powell said. “But they expected us to do things”—like rushing fraternities—“on their terms.” The expectation was that the blacks would assimilate to white norms, not that the institution itself would have to change to accommodate them. Stanford even hired a psychologist to help the black students assimilate, inviting them to meet her at a lawn party featuring the Jim Crow-era stereotype of black people’s favorite food, watermelon. In race theory, “we speak of a ‘tipping point,’” powell explained, “a point at which a minority reaches a critical mass and the racial dynamics suddenly change.” The minority starts chafing against institutional traditions, and the majority experiences anxiety that almost every familiar feature of their lives could become imperiled. In America, though, few historically white universities have reached a 30 percent tipping point—yet. In this way, transformation at UFS is not behind but ahead of American transformation, not an echo but an augury for our country, where last year nonwhite births outpaced white births for the first time. The UFS story suggests how dangerous it is to let polarization take hold. Like many institutions facing a demographic shift, UFS initially failed to take an active enough role in managing the change. “Typically, management doesn’t track what’s happening, because they think change will happen organically,” reflected powell. “They may also be afraid to confront the implications of change.” At UFS, given the demographics of the Free State, the implications were that eventually, somewhere down the line, the character of the university would change enormously. An administration composed mostly of older white Afrikaners, well-disposed toward modest change as they were, didn’t adequately face that stark reality. They failed to encourage the formation of a new, joint identity and allowed prejudices to deepen—making it exponentially harder to bring the two sides together again. But not impossible. In 2009, a charismatic Stanford Ph.D., who quotes Shrek and Edward Said in the same breath, arrived at UFS to undermine the status quo. 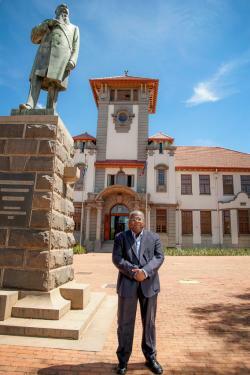 Brought onto troubled campus after troubled campus to heal them, Jonathan Jansen is South Africa’s most prominent university leader. He’s also the first black president UFS had ever appointed. Four years into his tenure, he has made dramatic inroads toward reintegrating many of the dorms, winning praise from black and white students alike. But he decided if the students had no practice making bridges between black and white, he would lead by being the bridge himself. He began with a Nelson Mandela–like gesture: In his inauguration speech, he announced the university would forgive the four Afrikaner students who filmed the video humiliating their janitors and accept its own institutional responsibility for the event. “They are my students,” he declared in the speech. “I cannot deny them any more than I can deny my own children.” He followed up by deepening his engagement with the community, penning a regular column in the local Afrikaans paper and becoming a constant, nearly ubiquitous presence in student spaces. Sometimes he drags his desk outside the administration building and sets it up under a tree to encourage students to hang out. “I use Twitter,” he said. “Facebook. I just walk and talk.” As well as being approachable, Jansen has also been somewhat autocratic. He has shown that pairing these two traits can be extraordinarily effective in a chaotic milieu like UFS. 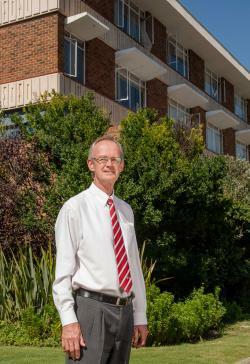 Jansen always made his end goal perfectly clear: full reintegration of the dorms, even though three-quarters of Afrikaner students had openly admitted in a 2007 campus poll that they preferred segregated living. In his first year, he demanded that every dorm integrate its freshman class 50–50, no migrations allowed, and unilaterally banned most of the dorm customs that had been lightning rods. He also instituted mandatory dorm conversations on race. “It’s extremely important to make the vision explicit,” he explained. “All we do is talk every single day in every single meeting about … the human project” of integration. Emme-Lancia Faro, a sportily dressed woman of mixed racial heritage who was recently elected head of a formerly all-white girls’ dorm, pointed to the emotionally charged meetings that Jansen demanded. In them, students are encouraged to let fly with all the prejudices they have about the other race group. Initially she felt “shocked” to hear some whites suggest blacks were lazy or didn’t like to shower. But then she realized that she too harbored negative stereotypes about whites she had never consciously articulated—like that all of them are rich. At Jansen’s so-called cultural renewal evenings, “I was changed,” Faro recalled. The students acknowledge there remains one nut left to crack: white men. Today, the UFS women’s dorms are demographically integrated, and male dorms that had been all white during the segregated decade are getting there, too. But male dorms that went “black” during the resegregation of the 1990s are still mostly black. When white boys hear that they’ve been placed in a historically black dorm, they usually choose to move off campus instead. The two dorms with black-sounding names—Khyalami and Tswelopele, which means “progress”—are having an especially hard time attracting white men. One of the places white male students have fled to be out of Jansen’s reach is a private dormitory named Heimat, a German word for homeland that is a common name of dorms at Afrikaans universities. In it, the old UFS dorm traditions are front and center. In its first year, 2009, the year Jansen showed up to campus, Heimat welcomed 40 UFS boys, then 70, then 100. Over the course of an afternoon, I met some 30 Heimat residents. One or two didn’t hesitate to state that a sense of white superiority had led them to choose Heimat, but most suggested they’d chosen the dorm not from a surfeit of confidence but out of fear—fear over what permanent place the white man will have in black-ruled South Africa. Over the past few years, the country’s most prominent black youth politician, Julius Malema, has suggested that President Jacob Zuma’s government should stop developing white residential areas and expropriate white-owned mines, and the government itself has declared its intent to transfer 30 percent of white-owned farms—the birthplaces of many of the Heimat boys—to blacks by 2025. Afrikaans-language educational spaces have already dwindled tremendously, with more than 90 percent of formerly Afrikaans schools closed or made bilingual since 1990. “I’m in love with my country, but does she still love me?” goes the anxious refrain of a popular Afrikaans country-and-western song played often on the radio. Many of the students mentioned the example of Zimbabwe next door, where Robert Mugabe’s government first preached racial reconciliation but later expropriated white farms and violently expelled those who resisted. Amid this pervasive sense of vulnerability, Heimat feels like a safe space. Hewing religiously to the dorm traditions, however random they might seem to be, allows the Heimat boys to feel they still have a legitimate culture—a culture that might protect them in a time of need. A freshman named Piet Le Roux took me to his bedroom to show me the exacting way the dorm manager makes freshmen arrange their clothes and toiletries for morning inspection. Shirts stacked from light to dark. Toothbrush, toothpaste, shaver, shaving cream and Bible, lined up in that order on the bed. Mix it up and you have to do push-ups. It’s not only young white men who are resisting Jansen’s vision. Black critics, especially those outside the university community, point to the overwhelmingly black demographics of the Free State and the nation’s persistent dearth of opportunities for blacks. They question why a fragile racial reconciliation should be permanently sustained by fastidiously maintaining integration between whites and blacks. Edwin Smith, the black education theorist, told me he respects Jansen enormously, but “this is an African country,” he pointed out. “Until our institutions are dominated by black people, you are still going to have a lopsided culture” that favors whites.